Saliva hormone testing is an accurate way of assessing estrogen, progesterone, DHEA, testosterone and cortisol levels. We offer this in order to help diagnose adrenal fatigue or other hormonal imbalances. What you will receive upon ordering this service:. 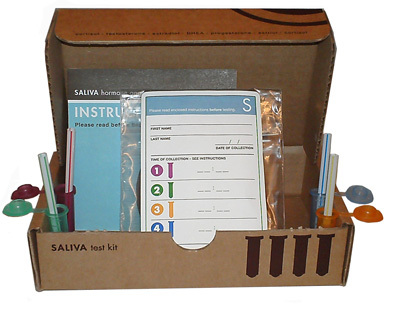 - saliva hormone testing kit (we will ship this to you upon your order). - 15 min phone consult with medical staff. **It's very important to follow the kit instructions that will be sent to you. The results will depend on it. **If you are not currently a client of Tad the Diet Coach then you MUST select NON-Client pricing on with the pull down menu selector below.